An accused serial “porch pirate” busted by Boulder, Colorado, police on Friday, Dec. 8, faces felony charges for plundering packages worth over $6,000 from doorsteps. 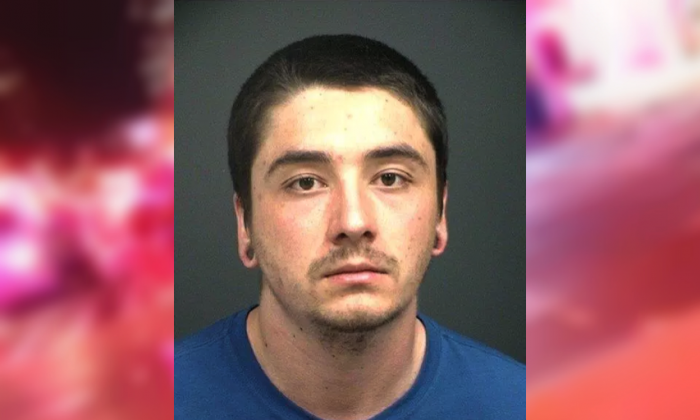 According to the Daily Camera, an arrest affidavit states that Christopher Seth, 22, was spotted by witnesses taking a package off a porch in Boulder, Colorado, then getting into a vehicle with another individual inside and fleeing the scene. The box reportedly contained $200 worth of socks from REI. Police tracked the vehicle and apprehended the Erie man, who according to KDVR admitted that he would drive around looking for packages lingering on porches, while his girlfriend remained inside the car as a lookout. A search of the suspect’s apartment revealed 44 items police think were stolen from doorsteps, CBS reports, including a Droid Star Wars Kit ($100), Dr. Martens women’s boots ($135), Petzl climbing equipment ($520), and a bedframe ($200). A complete list of items has been provided by investigators and is posted at the bottom of this article. Boulder police told CBS they’re trying to match the stolen goods with their rightful owners, but that those efforts are hampered by missing shipping labels and packaging material. Seth has been charged with felony theft and could spend up to three years in prison, KDVR reported, and his past criminal history includes a DUI and a pending indecent exposure case. He has been released on a $1,000 bond and is required to attend a status conference on Jan. 3. More deliveries ahead of Christmas means more packages on doorsteps, making similar crimes more likely. Another alleged “porch pirate” David Ramirez of San Antonio, Texas. was caught by police on Wednesday, Dec. 13, and accused of stealing thousands of dollars in packages and other items, according to a KENS5 report. Investigators said he stole items worth $3,000-$4,000 from victims across the city. So police are warning residents to take steps to avoid falling victim to this type of crime. The Ames Police Department issued this tongue-in-cheek video advisory on Dec. 8, containing a series of useful tips. In the video, police suggest residents monitor the tracking on packages and sign up for delivery alerts. Those who know they won’t be home when the package is delivered are advised to consider having packages delivered to their workplace or having them held at the delivery company’s location. Below is a complete list of stolen items found in Seth’s apartment, according to CBS. Investigators noted that not all items on various packing slips were recovered. And you, too, can help take the Grinch down a notch this holiday season and share this article far and wide on social media. Make sure these great tips reach as many people as possible!